Slowly the boat pushed us forward, away from certain shipwreck, and gained the upper hand in its struggle against the surging current. The victory did not spark spontaneous celebration; rather, we spent the next moments in a trembling recovery. 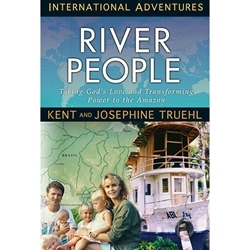 Kent, an American, and Josephine, an Australian, journeyed to an unfamiliar continent and set out to live on a riverboat deep in the jungle. With their four young children and ministry team, they served on the Purus River in the Amazon, bringing education, health care, and the love of God to remote communities. The result is an unforgettable story of sacrifice, adventure, and transformation.